You can thank Technodoll for this. I revamped a photo of the evening coast to make it look like a painting. Before, the image was pixelated due the fact that the light was nearly nonexistent. My camera doesn't have an ISO of 6400 to combat such situations. we stopped to capture an image of the coast since it was 'painted' in pastels. 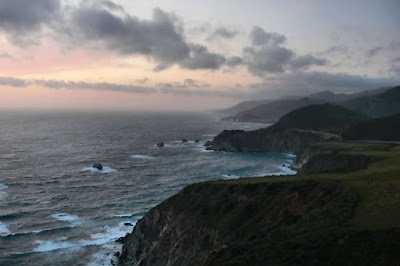 On the right you can see an outline of the Big Sur bridge. to use as your background image, be my guest. right click and select 'save as desktop background'. thanks for the background. love to you and Cody. That's a beautiful photograph and I like the way it looks like a painting. i have it on my desktop :) the shadows and details show up well. how dramatic this scene is! I have a tiny print of an oil painting on my book shelf that looks just like this. Beautiful! How sweet & thoughtful of you to share!